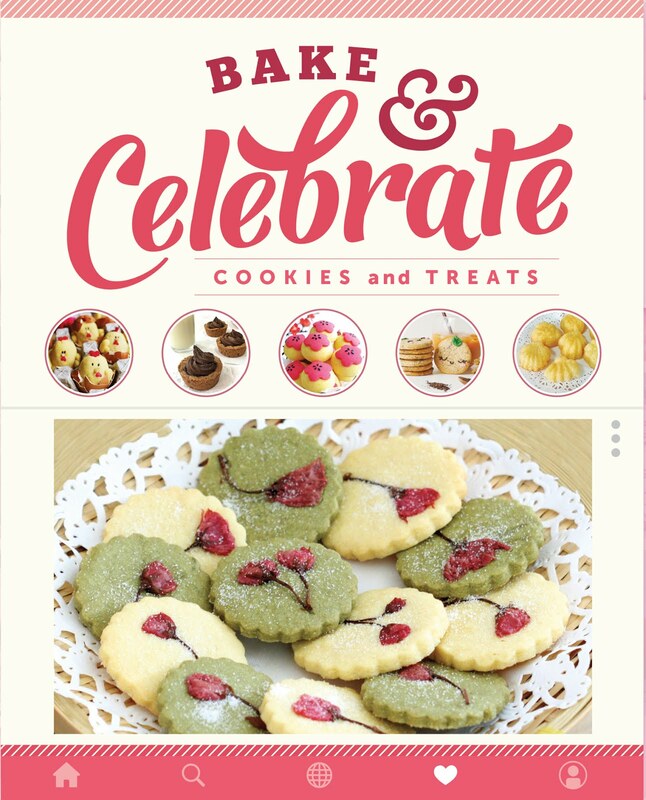 Wow, I realised that I haven't been baking anything new for months, apart from my cake orders and the same old like Blueberry Yogurt Muffin (for the kiddo) or Gula Melaka Banana Walnut Cake (for the hb). 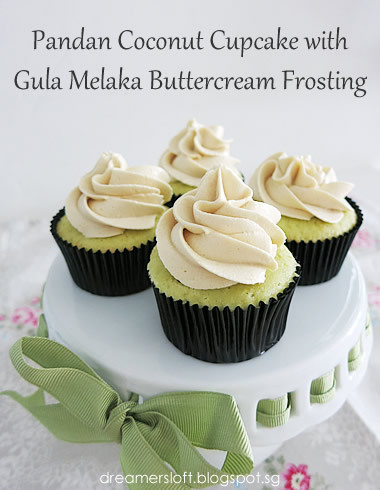 So here's presenting my Pandan Coconut Cupcake with Gula Melaka Buttercream Frosting! I have a small block of Gula Melaka left over from my banana cake bakes, it's kind of irritating taking up space in the fridge so I gotta use it up. 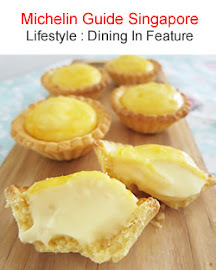 Have bookmarked several recipes on pandan and gula melaka, finally decided to adapt a recipe from BitterSweetSpicy. 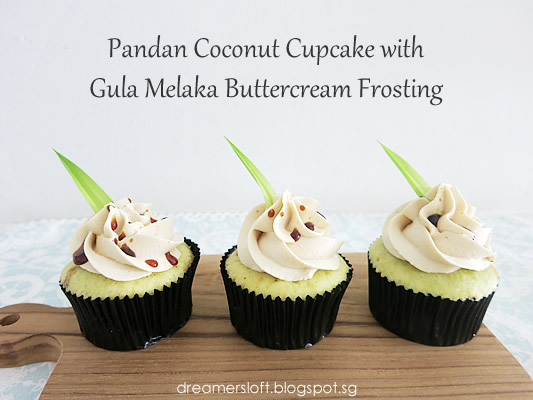 I think the combination of Pandan Coconut Cupcake and Gula Melaka Buttercream sounds heavenly. Initially I had doubts about making this particular cake and frosting because looking at the sugar content and method, I knew that this was going to be sweet, and the cake texture would be more dense type. Personally I prefer cakes that are light and tender and less sweet such as sponge cake, combined with chantilly cream or whipped cream. Or just a simple chiffon cake. Made slight changes to the recipe like reducing amount of sugar for both cupcake and frosting. Also increased the amount of pandan juice and reduced the amount of coconut milk, hoping that the coconut milk flavour will not be too strong and pandan flavour will stand out more. 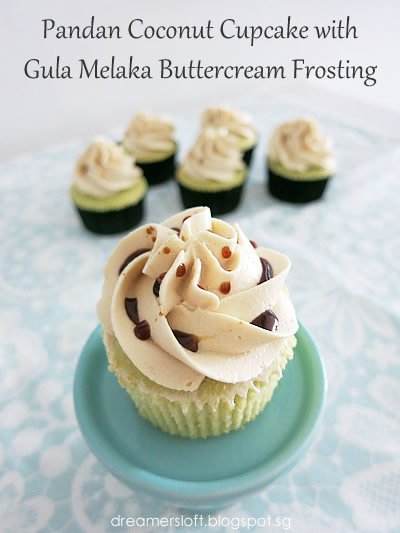 Initially I didn't drizzle any Gula Melaka syrup onto the buttercream frosting and the cupcakes looked kind of plain. Was about to wash the pot (with a bit of syrup left) when the idea came to my mind. Bingo! The cupcakes looked more interesting now. And then, suddenly another idea of decorating the cupcakes further with tiny pandan leaves. Wow, now my cupcakes look kinda of chic and atas-looking. LOL! I didn't bother with any colouring to the cake as well, so the cake wasn't tinted green, but rather a tinge of pale green tone, something like avocado. The cupcake turned out quite well, moist and dense, but not too heavy. The coconut fragrance is present, slightly overpowering that of the pandan. Still a tad sweet, luckily I reduced some sugar. 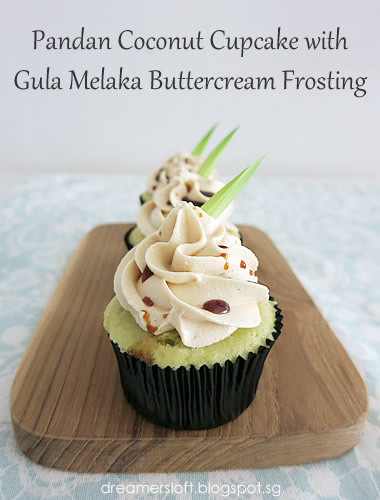 The buttercream is surprisingly not too heavy with a tinge of Gula Melaka taste. The additional drizzled syrup accentuated the overall taste, glad that I decided to drizzle some onto the frosting. 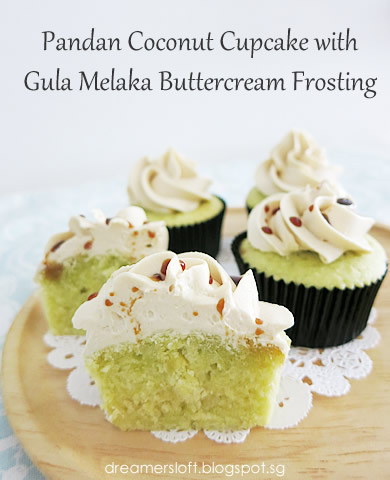 The combination of the pandan coconut cake and Gula Melaka buttercream is so much better than expected, I found myself having one bite after another and soon, one cupcake gone, leaving me craving for more. Had to stop myself from having another one. (A) Prepare pandan juice. Wash and trim 20 pandan leaves into 1" length. Place the leaves into electric food chopper and grind finely. Add about 3 tbsp of water to the ground pandan leaves and squeeze the juice. Sieve and set aside. (B) Prepare cupcake batter. Preheat oven (top/bottom heat) to 180 degree celsius. Line muffin pan with cupcake cases. Set aside. Sift the cake flour, baking powder and fine salt into a bowl. Set side. Mix coconut milk, water, pandan juice (from step 1) and vanilla extract, stir till blended. Set aside. Place unsalted butter in a mixing bowl, add sugar and beat at medium speed using the paddle attachment till creamy and fluffy. This will take about 3 mins, stop to scrap sides of bowl, then continue for another minute. Add eggs, one at a time, mix till incorporated. Add the flour mixture (from step 3), alternating with the coconut/pandan mixture (from step 4), in 3 additions. With each addition, mix till just incorporated, do not overbeat. Using ice-cream scoop, fill batter into cupcake cases, till about 2/3 full. Place muffin pan on the middle rack of the oven and bake for about 20 mins. Remove from oven and cool the cupcakes on a wire rack completely before frosting. (C) Prepare Gula Melaka Syrup. Place Gula Melaka, water and pandan leaves in a heavy-based saucepan over low heat. Stir until all the sugar has melted, and mixture comes to a boil. Remove from heat and set aside to cool completely. (D) Prepare buttercream. Place egg whites, sugar and salt in a mixing bowl over a pot of simmering water. Whisk continuously until the mixture is hot to touch and sugar is dissolved (rub some mixture using fingers, if it feels grainy, sugar hasn't dissolved completely). Transfer to mixer, beat the mixture using whisk attachment on medium high speed for about 4-5 mins, until stiff peaks and mixture has cooled to room temperature (touch the bottom of bowl). Turn speed to medium and add the butter, piece by piece. Keep beating till mixture gradually turns creamy and velvety, about 4-5 mins. Add the Gula Melaka syrup, 1 tsp at a time, till incorporated. I added about 5-6 tsp. The buttercream is ready for use. Transfer buttercream to piping bag and frost the cupcakes. 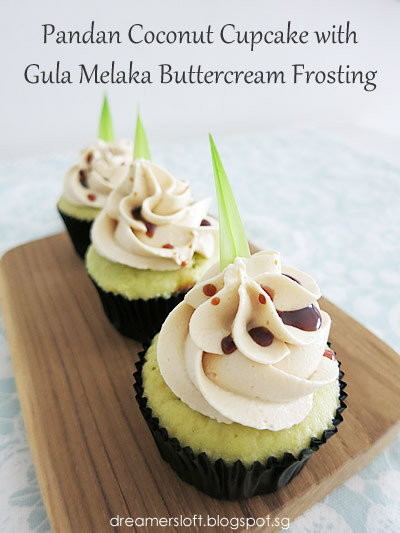 Drizzle some Gula Melaka Syrup leftover (from C) onto the frosting if desired. And if anyone is interested in ordering this cupcake, drop me a note at megtan@singnet.com.sg. I haven't tried baking it as a whole cake. Should be able to do it. I reckon you can try 2 x 7" or 8" round pans. And since it's a whole cake, have to bake for 35-45 mins at a lower temperature, probably 160-170 degree celsius. 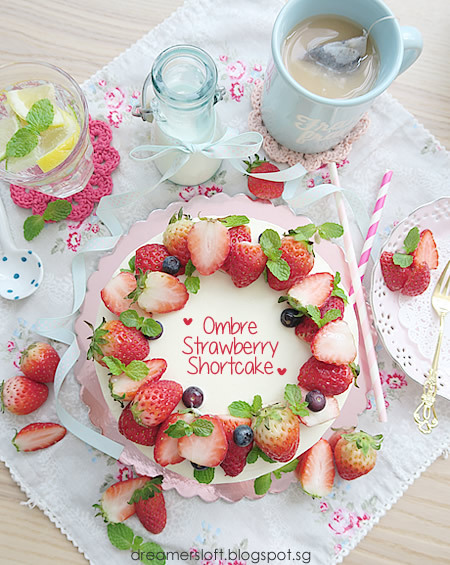 Check surface of cake to prevent browning too fast and test using skewers to check doneness. Do you have any advice if my cupcake has a hump on top n cracks? Like a volcano peak. Thanks. Will the buttercream gets soft or melts? I usually have problems with maintaining the stability of buttercream. This buttercream can stay at room temperature for around 30 mins and remain firm. Beyond that, it will get softer and softer for probably another 30 mins. If you have chilled the whole cupcake together with the buttercream beforehand, the buttercream will stay hard and firm for longer period of time. I haven't tried any shortening/krimwell before. What I suggest is to make and frost the cupcakes, chill them in the fridge till the buttercream frosting is hard and firm. Then it will be able to last longer in the open.